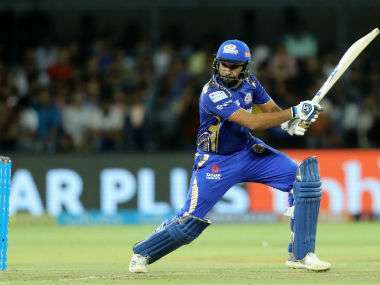 Home IPL 2019 Rohit Sharma IPL12: What records will Rohit Sharma set today? 8.98 Rajasthan Royals's economy in IPL 2019 -- the poorest among all teams in IPL 2019. 11.22 Ben Stokes's economy in IPL 2019 -- the worst among all bowlers bowling at least 15 overs in the tournament. Interestingly, Stokes has scored his runs only at a rate of 7.89. 12.38 Rohit Sharma's average against the Rajasthan Royals as a captain in IPL matches -- his worst against any side. In 8 innings Rohit has scored only 99 runs with a highest of 40. 86.48 Percent of all wickets taken by the bowlers at the Wankhede in IPL 2019 have been taken by the pacers -- the highest among all grounds. 87 Runs needed by Rohit Sharma to complete 8,000 runs in Twenty20 cricket. He will become the eighth player overall and third from India to do so. 100 Rohit Sharma will captain Mumbai Indians for the 100th time in a Twenty20 game.